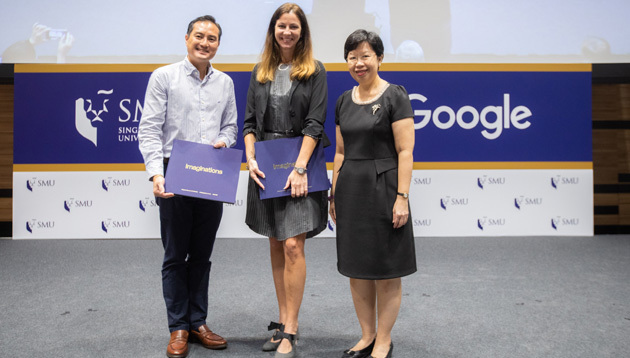 Singapore Management University (SMU) and Google Singapore have signed an agreement to offer the SMU-Google Squared Data & Analytics Programme to SMU’s undergraduate students, making it a first for Google to extend this course to undergraduates of a local university. The partnership was announced by SMU President Professor Lily Kong and Stephanie Davis, Country Director of Google Singapore yesterday (31 January), with Tan Kiat How, Chief Executive Officer of Infocomm Media Development Authority (IMDA), as the guest-of-honour at the event. The SMU-Google Squared Programme aims to equip SMU undergraduates with industry-ready data analytics skills to contribute to the knowledge economy, and increase the availability of data analytics talent for the ecosystem. Open to all SMU students at its six schools from their second year of study, this collaboration entails a six-month extended internship programme at a Google partner company in the media industry and earn credit in the process. Students on the programme will return to campus for up to one day a week during term time to read up to two additional courses while on the work-study elective. The inaugural batch of the SMU-Google Squared Data & Analytics Programme has some 25 students. About 50 students are expected to be enrolled in the second run of the SMU-Google Squared Data & Analytics Programme. In further news, ST Logistics has signed two Memorandums of Understanding (MoUs) with NTUC LearningHub and National University of Singapore (NUS), in a bid to upskill Singapore’s logistics workforce, in the face of increased automation and digitalisation. The MoU between NTUC LearningHub and ST Logistics signifies the start of skills-upgrading efforts between the two entities. ST Logistics and NUS’s MoU provides training opportunities for working adults, providing new knowledge, skills, and certification through technology courses, specialist certificates, bachelor programmes, and Masters programmes. Both MoUs mark the start of a common learning framework for companies in Singapore to level up talent in their respective industries, acting as models for other business sectors. Four institutions (NTUC Learning Hub, NUS, Republic Poly, and Korn Ferry Advance) were present at the ceremony to promote career guidance programmes and PME-specific skills advancement courses. 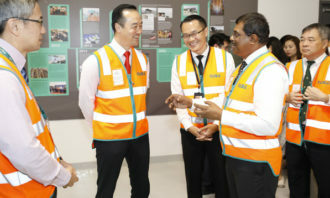 Dr Koh Poh Koon, Senior Minister of State, Ministry of Trade and Industry, witnessed the signing ceremony that took place at Toll City, a S$228-million, next-generation logistics hub launched in July 2018, housing Industry 4.0 technologies, such as driverless vehicles and smart-city telematics. In addition to the newly-minted partnerships and upskilling framework, ST Logistics and Toll Group are focused on supporting the development of local Singapore talent through various internal and partnership programmes. Toll’s Graduate Programme (now in its third year), is designed to attract and develop future logistics leaders, with global rotational assignments across the company’s three operating divisions. ST Logistics and Toll Group induct young talent via the SkillsFuture Earn and Learn Programme for Logistics and the Singapore-Industry Scholarship programmes. As more personal mobile devices are brought into the workplace, IT and its security issues has been identified as one of the bigge.. The company said staff have had to endure harassment following allegations the fast food chain was funding conflict in the Middle ..